The Government’s national identity card scheme was “in the intensive care ward” after leaked documents showed plans to issue UK citizens with the cards have been delayed until after the next election. Amid growing doubts that the multibillion pound scheme will ever see the light of day, a confidential Home Office report suggests that the widespread introduction of cards for British nationals will not come until 2012 at the earliest. That is two years later than the Government has previously stated. It would also ensure that the general introduction of ID cards took place well after the next election, which must be held by May 2010 at the latest. The Home Office paper, entitled “National Identity Scheme Delivery Strategy” and marked “Restricted” was prepared for senior officials on 20 December 2007. It sets out “a high level roll out strategy for the National Identity Scheme” and shows a timetable for implementation. It shows that “Borders phase II (UK citizens),” the project for issuing cards to UK nationals in large numbers is now slated to begin in 2012. The Government has said it plans to make ID cards compulsory, but only after a “voluntary” period during which anyone who renews a passport or driving licence will be automatically issued with a card. Last night’s leak follows Gordon Brown’s apparent hesitation over the future of ID cards in the Commons earlier this month. Downing Street has since insisted that Mr Brown’s position on the scheme has not changed, but opponents detect waning Government commitment to the project in the light of recent damaging losses of sensitive data by the public sector. David Davis, the Conservative shadow home secretary, last night said the document cast fresh doubt on the future of the ID card project. He said: “It is in the intensive care ward. There are clear flaws in the whole government strategy for data protection. Further fuelling suspicions of a Government climbdown on ID cards, a major review of the scheme appears to have been shelved. James Crosby, the head of the HBOS bank, completed a review of the potential private sector uses for ID cards last year. But the Treasury has now confirmed there is no date set for its publication. The leaked Home Office document makes clear that some British nationals like teachers and care workers could get cards as soon as next year. An ID card could be made a requirement for holding a job in a “position of trust” such as teaching or social care from 2009. An Identity and Passport Service spokesman said: “We have always said that the Scheme will be rolled out incrementally. The top cop in Texas has endorsed a plan for the state to develop enhanced driver's licenses that can double as border-crossing credentials. Texas Attorney General Greg Abbott on Tuesday ruled that the cards proposed as part of the state's high-tech licensing plan would satisfy federal law. Abbott was asked for his opinion about the initiative by the director of the Department of Public Safety. The Legislature recently authorized the plan to develop the license, which will be designed to meet nationwide standards for driving credentials recently released by the Homeland Security Department, as well as specifications for another initiative to speed cross-border travel. Several other border states are moving to issue licenses that would satisfy both the so-called REAL ID Act and the Western Hemisphere Travel Initiative. Abbott said in his opinion that enhanced licenses would be legal under federal passport laws if they conform to the technology, security and operational requirements of the travel initiative, which mandate that that the cards be tamper-proof and machine-readable. The ruling came as many states are considering the costs and consequences of developing driver's licenses to comply with REAL ID. Homeland Security earlier this month released the final regulations for the statute. Homeland Security Secretary Michael Chertoff has said the final rules were designed to allow states more flexibility in meeting REAL ID's requirements. The department delayed several key deadlines to give states more time to enroll drivers, which Chertoff said should reduce the costs of compliance considerably. Several states already have decided to ignore REAL ID. Privacy advocates also are pushing Congress to move on federal legislation to repeal the law. Montana Gov. Brian Schweitzer, a Democrat, has continued to reach out to other governors in his quest to block the law. He said in a letter to governors last week that he wants them to speak with "one unified voice and demand that Congress step in and fix this mess." 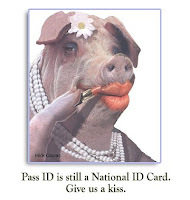 Schweitzer signed a bill last year that prevents Montana from participating in REAL ID. Members of Montana's congressional delegation also have expressed serious concerns. Legislation has been offered in both chambers of Congress to wipe the REAL ID slate clean and restart a negotiated rulemaking process to develop licensing standards that was abandoned when the bill was passed. Schweitzer wrote that the cooperative rulemaking process would give state officials a seat at the table and could facilitate the development of more secure IDs faster than REAL ID ultimately will with the new deadlines. I've written about the U.S. national ID card -- REAL ID -- extensively (most recently here). The Department of Homeland Security has published draft rules regarding REAL ID, and are requesting comments. Comments are due today, by 5:00 PM Eastern Time. Please, please, please, go to this Privacy Coalition site and submit your comments. The DHS has been making a big deal about the fact that so few people are commenting, and we need to prove them wrong. This morning the Senate Judiciary Committee held hearings on REAL ID (info -- and eventually a video -- here); I was one of the witnesses who testified. Finally, and perhaps most importantly for Americans, the very last paragraph of the 160-page Real ID document deserves special attention. In a nod to states' rights advocates, DHS declares that states are free not to participate in the Real ID system if they choose--but any identification card issued by a state that does not meet Real ID criteria is to be clearly labeled as such, to include "bold lettering" or a "unique design" similar to how many states design driver's licenses for those under 21 years of age. One likely outcome of this DHS-proposed social segregation is that people presenting non-Real ID identification automatically will be presumed suspicious and perhaps subject to additional screening or surveillance to confirm their innocence at a bar, office building, airport or routine traffic stop. Such a situation would establish a new form of social segregation--an attempt to separate "us" from "them" in the age of counterterrorism and the new normal, where one is presumed suspicious until proven more suspicious. 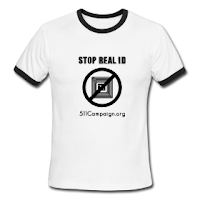 EDITED TO ADD (5/8): Status of anti-REAL-ID legislation in the states. EDITED TO ADD (5/9): Article on the hearing. BEAT THE CHIP NOTE: The people at INPUT want you to pay taxes to have yourself tracked with RFID chip in your American driver’s licenses. It is your job to boycott their business and make sure they get a first class education in consumer ethics. RESTON, Va., Jan. 23 /PRNewswire/ -- The final rule for REAL ID compliance provides the necessary guidance for states to begin building systems and linking networks to fulfill the mandates of the 2005 legislation, according to a newly released report by INPUT, the authority on government business. While states have until May 11, 2008 to declare their intention to comply with REAL ID, INPUT does not expect widespread resistance to derail the new approach. "Compared to the proposed rule of last March, DHS has made a credible effort to reduce or eliminate Constitutional as well as procedural and technical barriers to REAL ID compliance in many areas of the final rule," said Chris Dixon, manager, state and local industry analysis for INPUT. "The final rule should serve as a starting gun for vendors to begin working with states on compliance. Even if REAL ID were repealed in the next year or so, the concepts and approaches laid out in the final rule would still form the basis for an ongoing, generational overhaul of state drivers-licensing systems.
" With the release of the final rule for the REAL ID Act of 2005, the U.S. Department of Homeland Security (DHS) has revised its approach from that of the Notice of Proposed Rulemaking (NPRM) of March 3, 2007. A variety of deadline extensions have been granted at least in part to provide the federal government with additional time to prepare various databases for interface with the states. The REAL ID "Verification and Data Exchange Architecture" will leverage the American Association of Motor Vehicles Administrators' AAMVAnet as the "hub" for several "federated querying systems." "Streamlining the source-document review and image-capture process will be essential to reducing the vast delays in processing of an estimated 240 million drivers," said Dixon. "Backend record-keeping and integration of state systems with the various federal and multi-state backbone systems will be the primary IT concerns in the near term. States will need long-term vendor support in implementing FISMA-compliant security around DMV databases and facilities, as well as downstream vital records production and systems -- especially birth certificates." According to INPUT's analysis, the weakest link in the final rule concerns personal information included on the surface of -- or embedded electronically in -- the REAL ID card. While the final rule is defensible in these areas, controversies in this area are premised more on philosophy about the role of government than the specific technologies of REAL ID. If DHS and REAL ID-complying states do not address this issue head on, REAL ID will remain open to continued vigorous state and individual resistance based on fears of skimming and eventual incorporation of radio frequency identification (RFID) technology into the card. INPUT's REAL ID -- Final Rule Provides Extra Time and Flexible Options for Technical Compliance INPUT/Output(R) report is available on INPUT's website at http://REALID08.input.com About INPUT INPUT is the authority on government business. Established in 1974, INPUT helps companies develop federal, state, and local government business and helps public sector organizations achieve their objectives. Over 1,300 members, including small specialized companies, new entrants to the public sector, and the largest government contractors and agencies, rely on INPUT for the latest and most comprehensive procurement and market information, consulting, powerful sales management tools, and educational & networking events. HARRISBURG, Pa. - The Pennsylvania Transportation Department is getting more time to implement new rules for making driver's licenses more secure. The state says it'll have until the end of next year to comply with the federal REAL ID Act. The law is supposed to make it more difficult for terrorists, illegal immigrants and others to get official identification. PennDOT's extension allows state residents to continue using their existing driver's licenses and identification cards for official federal purposes through Dec. 31, 2009. The agency says the delay gives it more time to figure out what its options are, how much it's going to cost and how it'll affect people. CNN) -- Americans may need passports to board domestic flights or to picnic in a national park next year if they live in one of the states defying the federal Real ID Act. Homeland Security Secretary Michael Chertoff says there are no plans for a federal database of drivers' information.The act, signed in 2005 as part of an emergency military spending and tsunami relief bill, aims to weave driver's licenses and state ID cards into a sort of national identification system by May 2008. The law sets baseline criteria for how driver's licenses will be issued and what information they must contain. The Department of Homeland Security insists Real ID is an essential weapon in the war on terror, but privacy and civil liberties watchdogs are calling the initiative an overly intrusive measure that smacks of Big Brother.More than half the nation's state legislatures have passed or proposed legislation denouncing the plan, and some have penned bills expressly forbidding compliance. "This is not a mandate," Chertoff said. "A state doesn't have to do this, but if the state doesn't have -- at the end of the day, at the end of the deadline -- Real ID-compliant licenses then the state cannot expect that those licenses will be accepted for federal purposes."